Neville Ladduwahetty, in his article on the National Anthem raises a very valid point, namely that we are prepared to violate the Constitution for the sake of reconciliation. The LRRC whose main objective was reconciliation, was prepared to violate the Constitution and allow the National Anthem to be sung in Tamil. To avoid a major irritant was the excuse for doing so. The incumbent President whose role in this respect has been enumerated in your editorial (unflinchingly vaporized the then Government which had a majority in parliament and installed a minority one; he decreed that Mohan Pieris who had been functioning as the Head of the Judiciary was not the Chief Justice. 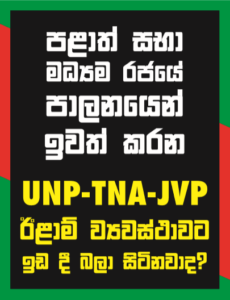 Then he appointed Nimal Siripala de Silva whose party is not in the opposition as opposition leader. (6/4 Island) He has violated the Constitution for the fifth time by declaring that the National Anthem could be sung in Tamil.